Protesters march from the Garden of Remembrance to Dame Street, in protest at the transfer of private debt to the citizens. 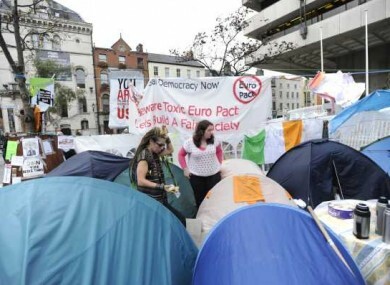 UP TO 2,000 people from the Occupy Dame Street movement have held a protest march in Dublin city centre today. The march was to show solidarity to those who have been asked to shoulder a national debt that is not theirs. The crowds marched from the Garden of Remembrance to the Central Bank plaza on Dame Street, which has become home to the Occupy Dame Street protests which began two weeks ago today. There, the group was entertained by musician Billy Bragg, who performed a number of songs for the group and who has previously expressed solidarity with the Occupy movement. Organisers say they were galvanised by a “shared anger that the power and wealth of the nation was held in the hands of a tiny minority”. They claim that momentum for their protests is now gathering, and insist they have no plans to abandon their protest. Similar Occupy protests – which have sprung up worldwide following the perceived success of the Occupy Wall Street demonstrations – have since been founded in Galway and Cork. Among the protest’s goals are the removal of the EU-IMF role in Irish financial policy, and the return of Ireland’s natural resources to public control. Email “Occupy Dame Street protesters hold march against ‘debt nationalisation’”. Feedback on “Occupy Dame Street protesters hold march against ‘debt nationalisation’”.